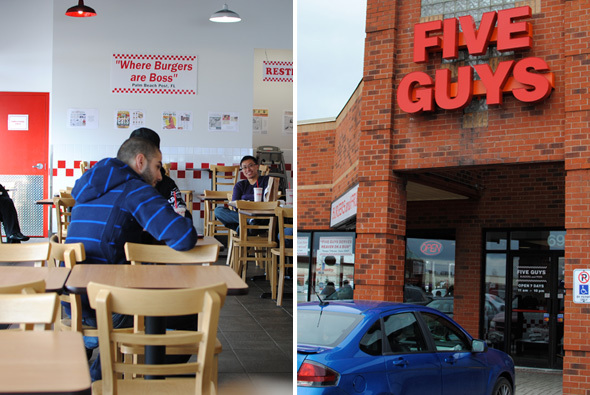 Five Guys Burgers and Fries has finally arrived in the GTA. I have to drive to Woodbridge for this meal, but the chain (sometimes referred to as an East Coast version of In-and-Out ) also has a location in Mississauga, is opening in Scarborough soon and will be expanding to Brampton and the downtown Toronto core before all is said and done. In other words, Five Guys is coming soon to a neighbourhood near you. So what should you expect? The vibe as we walk into Five Guys is gritty and urban. 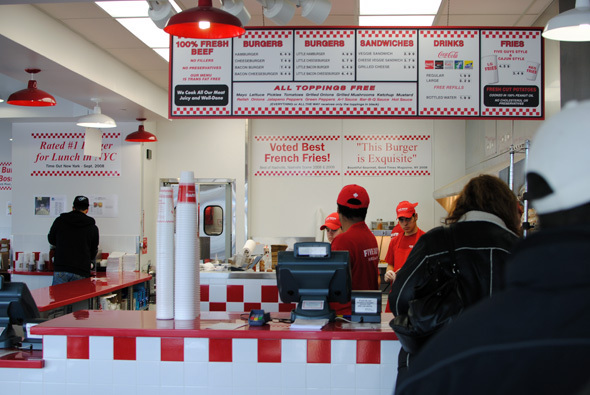 Unlike the warm family restaurant atmosphere many fast food chains promote, Five Guys is a giant sterile room with blaring 80's rock, plain tiled floors, white walls and gaudy plastic signs. Like the difference between a bar and a brewery, Five Guys is more of a burger factory than it is a restaurant. This is not a bad thing. Equally austere is the menu. There are no salads or chicken strips. You can have burgers, hotdogs and fries. For vegetarians, they offer a kids menu grilled cheese sandwich, or, no joke, burger toppings in a bun. This "veggie sandwich" will cost you $2.99. I order a cheeseburger and my companion a hamburger. All regular burgers are double patty behemoths, with "little" versions available as a one patty alternative. A wide variety of toppings -- mayo, relish, onions, lettuce, pickles, tomatoes, grilled onions, grilled mushrooms, ketchup, mustard, jalapeno peppers, green peppers, steak sauce, bar-b-q sauce and hot sauce -- are all free and can be loaded on to your hearts content. For some reason, Five Guys also offers complimentary peanuts in giant tubs. I don't know what peanuts have to do with burgers, but they're tasty and remind me of baseball games. They also help kill the eight minutes or so it takes for our orders to be ready. My cheeseburger ($7.49) is a sopping, greasy monstrosity. It's delicious. The sesame seed bun, slightly toasted and seemingly purposely deformed, is delightfully forgettable. It serves only as a means to hold the burger and at this, it only partially succeeds; it soon falls apart amid an indulgent mix of melted American cheese, grease and beef drippings. The toppings are fresh too, not a limp brown lettuce leaf or droopy yellow tomato slice in the bunch. 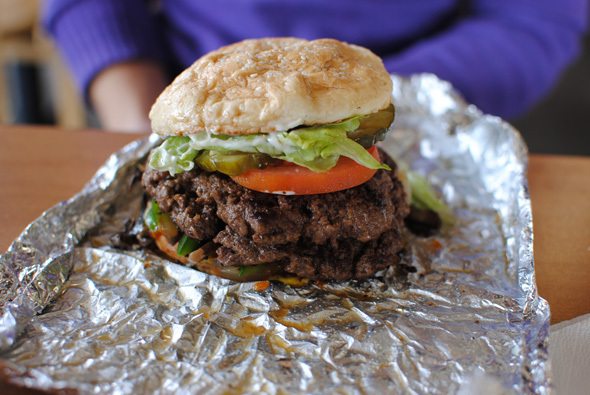 The patty itself is typical flat-top style, slightly crumbly and cooked to well-done (Five Guys only serves well-done burgers). The beef is moist and well textured, but lacks significant flavour and seasoning. The meat used is definitely fresh (Five Guys flaunts the fact their restaurants have no freezers) but the quality just isn't up to snuff compared to a place like The Burger's Priest . This is to be expected from a chain however, and it's still miles ahead of most other franchise fast food options. The hamburger ($6.49) is equally daunting and satisfying. Roughly the size of a softball, my companion has a hard time fitting the burger in her mouth. Petite eaters, you have been warned. The fries ($3.49, regular size) are crispy and slightly overcooked, which I happen to like. The chunks of fresh cut potato are huge and come in a ridiculous portion skin-on. The Cajun fries are dusted with a smoky chili powder that is tasty, but my preference is for the plain variety. 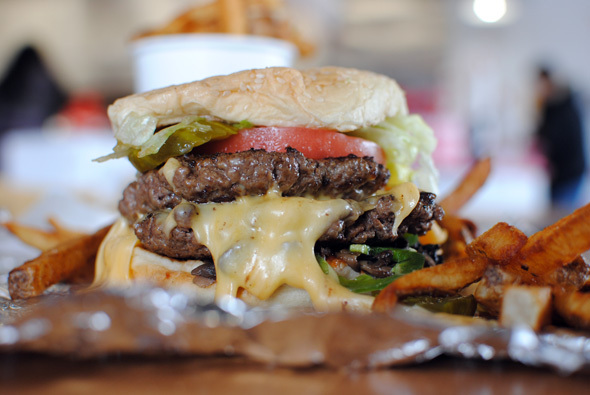 Five Guys is not a gourmet burger. There is no foie gras to be found on the premises and you will be in and out in less than thirty minutes. 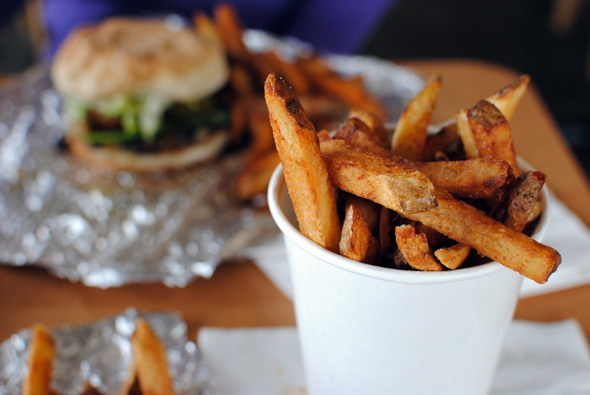 That said, although it might not compete with some boutique burgers in Toronto, for those seeking a no frills quickie Five Guys is an excellent choice. When compared to other fast food options, it actually becomes a bit of a no brainer. In other words - it's definitely been worth the wait.